Q: What causes cleft lip and palate anomalies? A: There are a number of reasons for the cleft anomaly including a genetic predisposition, diet, life style, lack of adequate vitamins especially folic acid, smoking while pregnant, and pollution. Research has shown that a genetic predisposition can be triggered by any of these factors thus increasing the chance for the cleft anomaly to appear more frequently among those who are poor. Q: Why do we see so few individuals with cleft anomalies in developed nations? A: Healthcare providers and the public healthcare system subsidize the cost of reconstructive surgery for most children born with cleft lips and palates. These programs are often not present in developing countries. Q: How is Rotaplast working to address this disparity? 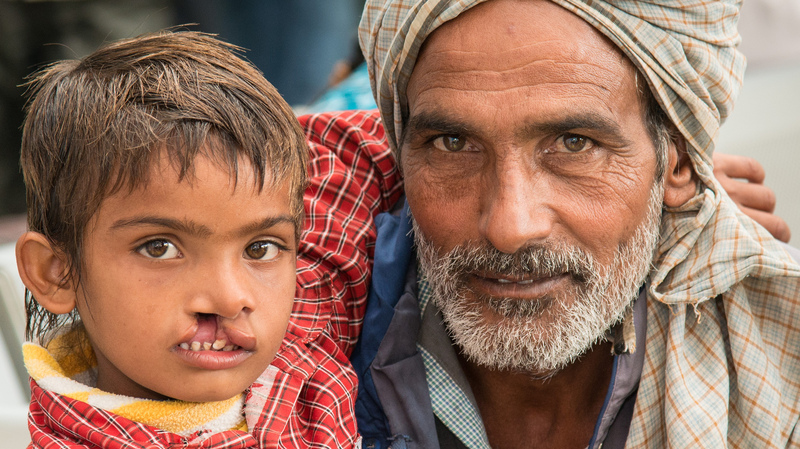 A: In addition to providing free reconstructive surgery, Rotaplast also teaches local surgeons about the most up-to-date surgical techniques for cleft cases. Local medical communities are encouraged to adopt a multi-disciplinary approach to treatment, including orthodontic and speech therapy follow-up programs. Q: Is the work of Rotaplast limited to the treatment of pediatric cleft lip and palate cases? A: Rotaplast’s primary mission is the treatment of children with cleft anomalies. In some locations, Rotaplast treats burn patients and those with other birth defects that can be corrected by plastic surgery. Occasionally, teenage and adult patients receive treatment. Q: How do I apply to volunteer with Rotaplast? A: If you are a medical professional, please consult our medical volunteers section to find out if you are eligible and download an application. If you are interested in becoming a non-medical volunteer with Rotaplast you can learn more about the work done on a mission and download an application in our non-medical volunteers section. Q: What is the length of a Rotaplast mission? What is a typical schedule? A: Travel time is two to three days. One day, usually Sunday, is set aside for fellowship with host Rotarians. The first full working day is the clinic day when our volunteer surgeons and pediatricians screen the patients that will receive surgery. Six to eight consecutive days of surgery follow the clinic. The last day is another clinic day when patients are examined one last time and parents are given final post-op care instructions. Q: How many people are on a Rotaplast team? A: A typical team has 30 members. Under special circumstances, the team size may be as small as 20 or as large as 45. A team will usually run three operating rooms daily for six to eight days. Each operating room requires a plastic surgeon, an anesthesiologist, an operating room nurse, and other support volunteers. The number of operating rooms determines the size of the recovery staff. Rotaplast includes a dentist, orthodontist, and speech pathologist on many of its teams. A genetic component is sometimes included which affords counseling to affected families and a venue for research. Approximately two-thirds of a Rotaplast team is made up of medical professionals and the remaining third are non-medical volunteers. Q: Who covers the expenses of each Mission? A: Rotaplast pays the airfare for all medical volunteers and asks that non-medical volunteers pay for their own airfare. As group booking is necessary for logistical reasons, all volunteers are booked as a group through a travel agency appointed by Rotaplast. All volunteers should also budget some money for personal spending. In most sites breakfast and lunch are hosted meals, in some sites dinner is also hosted. Shopping opportunities occur in some sites, but are limited in others. For more specific information about any site, contact Evelyn Abad . Q: Does Rotaplast provide travel insurance for the volunteers? A: We do not provide travel insurance for volunteers. We do, however, recommend coverage. We do not recommend specific coverage or carriers for travel insurance or additional medical coverage. Q: May I have a single room while I am on the mission? A: Rotaplast teams share double or triple rooms. Hotel facilities are always adequate, and rarely luxurious. To encourage team spirit, team members are urged to stay in the shared rooms. Team members who request a single room will be accommodated if possible, provided that they agree to pay for the full price of the room, for the duration of the mission. Q: Is Medical Volunteer airfare paid for by Rotaplast? A: Rotaplast covers Medical Volunteer airfare from major cities in the US or Canada to the mission site. Major cities are defined by the Rotaplast designated travel company and are large cities with major airports that are serviced by multiple airlines and have multiple flights each day. The Rotaplast travel company works with each volunteer to arrange their travel. The volunteer is responsible for the expense of getting to the major city, but must arrange this in coordination with Rotaplast and the Rotaplast travel company. All volunteers (medical and non-medical) must travel to the mission site with the team, and are subject to paying a fee if they choose to travel home separately from the team. Q: What gifts would be appropriate for the children on site? A: Good gifts for the children are coloring books with crayons/markers and small soft toys. Remember, that they may/may not know how to read, and most likely do not speak English. Please do not bring bubbles or play-doh. The children eat these items, or they get on the floor and can cause them to slip. Q: What gifts would be appropriate for the local hosts? A: Good gifts for local hosts are items that represent your home town, state or country such as picture/coffee table books, T-shirts, or locally made products (wine from Napa, maple sugar from the Midwest, etc). If you have the ability to print digital photos on site, you can bring a picture frame and then take a photo of your host and you during the mission, and present it to them in the frame. Local Rotarians always appreciate Rotary banners from other clubs. Remember, our hosts may not speak or read/write in English. Q: How many children receive treatment on each mission? A: Approximately 100 children receive treatment during each mission depending on the number of operating rooms available. Q: How many missions are conducted each year? A: Rotaplast missions are expanding annually in tandem with increasing resources and potential mission sites. Rotaplast is planning 15 medical missions for the current year. Q: What does Rotaplast provide? A: Rotaplast provides logistics, solicits donations of non-durable medical supplies such as sutures and anesthesia (valued at $45,000 per mission), transports $160,000 worth of durable medical equipment, staffs the teams, conducts site visits, and works with the sponsors both domestically and internationally. Rotaplast covers the cost of transporting the medical personnel and the Mission Director. Non-medical volunteers cover the cost of their own airfare to the site. Housing and food for the team are either provided by the host Rotarians or funded through Rotaplast supporting Clubs and Districts. Rotaplast makes travel arrangements for the entire team. All team members must purchase tickets through a Rotaplast designated travel agent because contracts have to be negotiated with vendor airlines to transport the team with all the boxes containing supplies and equipment (30 to 40 boxes per mission) either at no additional charge or minimal fees. Q: What is the relationship between Rotaplast and Rotary International? A: Although Rotaplast began as a project of the Rotary Club of San Francisco, it became a separate non-profit corporation in 1996. As such, Rotaplast is not a project of Rotary International nor do donations to Rotaplast count as donations to The Rotary Foundation. Rotaplast acts as a vehicle to help Rotary Clubs worldwide participate in a hands-on international service project and bring the finest medical care to underprivileged children. Rotaplast sponsorship fulfills a Club’s international service requirement. Rotaplast International, Inc. is not a project of Rotary International, which assumes no liability therefore.